Fall is my favorite season for fashion. The weather is perfect so you don't feel like you're melting and you aren't so concerned with just being warm that you don't really care what your outfit looks like. This year I'm loving really glamourous pieces, rich color, and mixing textures. Be sure to check out my SHOP tab for more! What are you loving this season? Fall fashion is my favorite too girl. I love all of these pieces. Those sole society slipper are so cute, and those earrings are fabulous! Great picks. 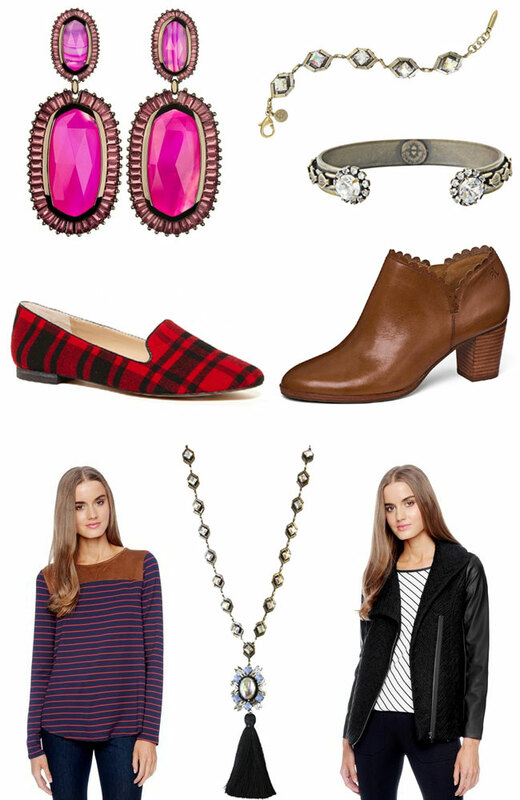 I love those plaid print loafers, they are perfect for fall! It's been chilly here so I dragged out the fall clothes a couple weeks ago! Those booties! I've been lusting over them since they were released! So stinkin' cute! Aren't they the best? Most booties look the same but they are a new spin and a great way to wear Jack Rogers in the fall! Fall is definitely the best season for fashion. I love all the leather trims this Fall, and the Ella Moss coat you have listed is a perfect example of this trend! That black jacket is a must-have! Great picks! I'm totally drooling over those plaid flats and that cuff! Gorgeous picks. Excited to add a new blog to my must-reads!